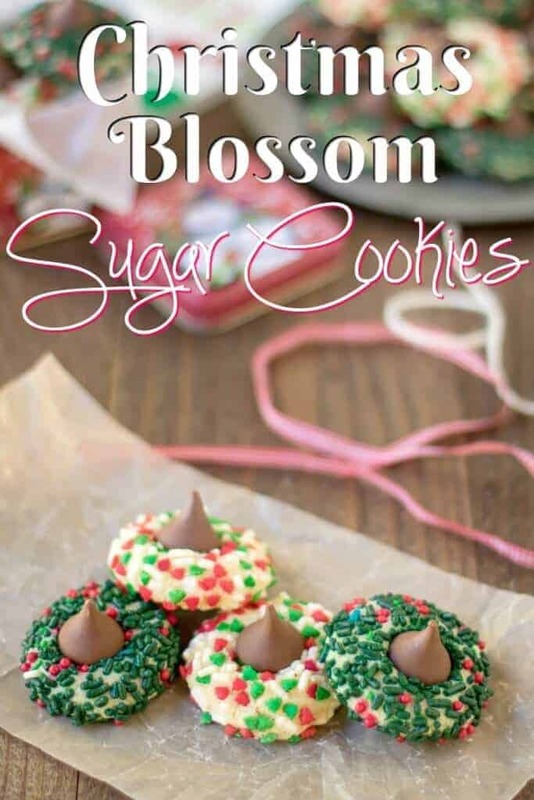 These Christmas Sugar Cookie Blossoms will rock your world! 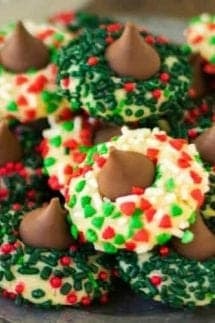 They have the sugar cookie, the sprinkles and they are topped with a delicious Hershey’s Kiss – what more can you ask from a Christmas Cookies and they are perfect for your cookie exchange! Christmas and cookies go hand in hand! Some of our favorites include our Rainbow Sprinkle Cookies and our Reindeer Oreo Cookies! Who doesn’t just adore Christmas Cookies? Christmas cookies are one of those things that just make me happy. I don’t know if it is the sprinkles or what…I just cannot resist a good and homemade Christmas cookie! That is why I absolutely am obsessed with these Christmas Blossoms Sugar Cookies (some will call them Thumb Print Cookies). They are everything Christmas cookie wrapped into one delicious treat. They have the sugar cookie, the sprinkles and they are topped with a delicious Hershey’s Kiss – what could be better than that – answer: nothing! These Hershey Kiss Sugar Cookies, which I like to call “happiness in a cookie” will be your new favorite! I also have a great version with peanut butter. Many of the traditional Blossom Cookies are actually made with peanut butter. We wanted to give you this peanut-free cookie option, but if you are a peanut butter fan, check out our Peanut Butter Blossom Cookies too (they can be made Christmas themed or not! 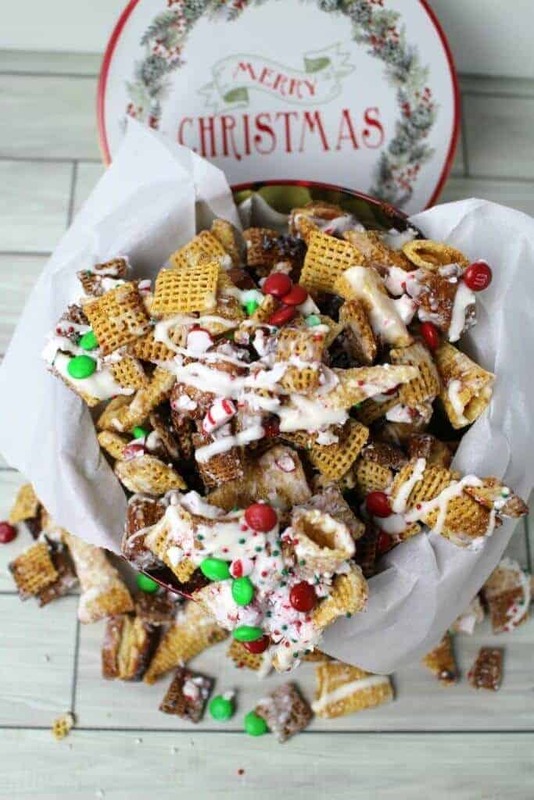 If you want to see some other really great Christmas Cookies, check out this helpful round-up – these were the BEST I found on Pinterest! 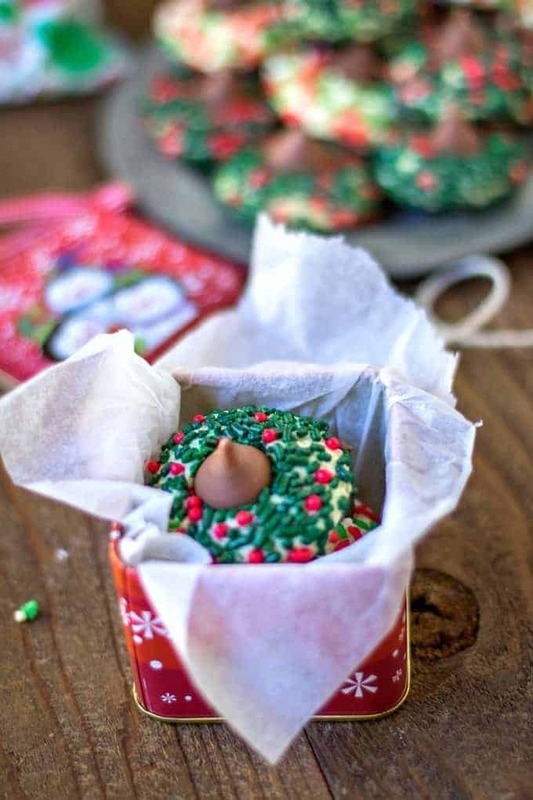 What else is great about these Christmas Blossom Sugar Cookies? 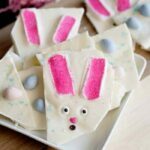 Well, they are really easy to make and pretty hard to mess up! If you know me, you know I like super easy recipes. These Christmas Sugar Cookie Blossoms will rock your world! 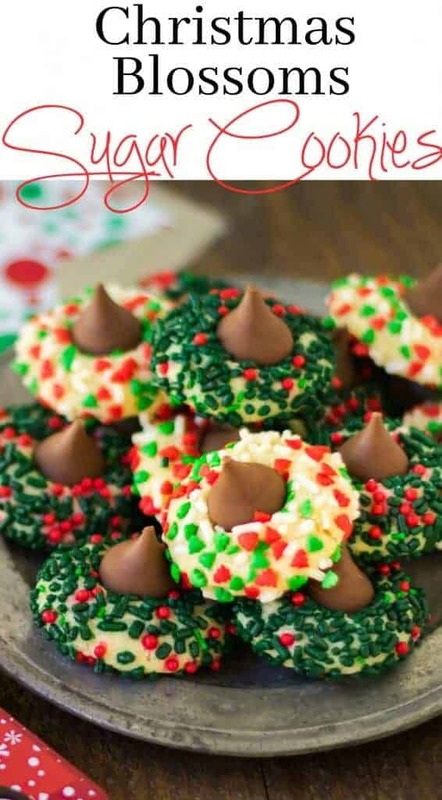 They have the sugar cookie, the sprinkles and they are topped with a delicious Hershey's Kiss - what more can you ask from a Christmas Cookies and they are perfect for your cookie exchange! Preheat oven to 350 and line a couple of cookie sheet with a silicon baking mat or parchment paper. In a bowl mix the flour, baking powder and that dash of salt (set aside). Add in the yolks one at a time, mixing it thoroughly each time. Next, add the lemon extract and zest and mix until combined. Slowly add the flour mixture and mix until well combined. If the dough is a bit sticky to the fingers, chill for 30 minutes to an hour in the refrigerator. Roll the dough into 1/2 inch balls (I used a cookie scooper) and then roll in your favorite sprinkles. Bake for 8 minutes, or until the bottom is very slightly turning golden brown. Keep an eye on the cookies, so don't want to over bake them! They still need to be soft to the touch, when you remove them from the oven. Allow them to cool for a couple of minutes before adding the kisses. Gently press the Hershey Kiss in the center of the cookie and immediately put the pan in the fridge, so the chocolate doesn't melt over the cookies. Keep them in the fridge until the cookies are completely cool. Love them? Great – let me know! Share pictures of YOUR cookies with me on Instagram! 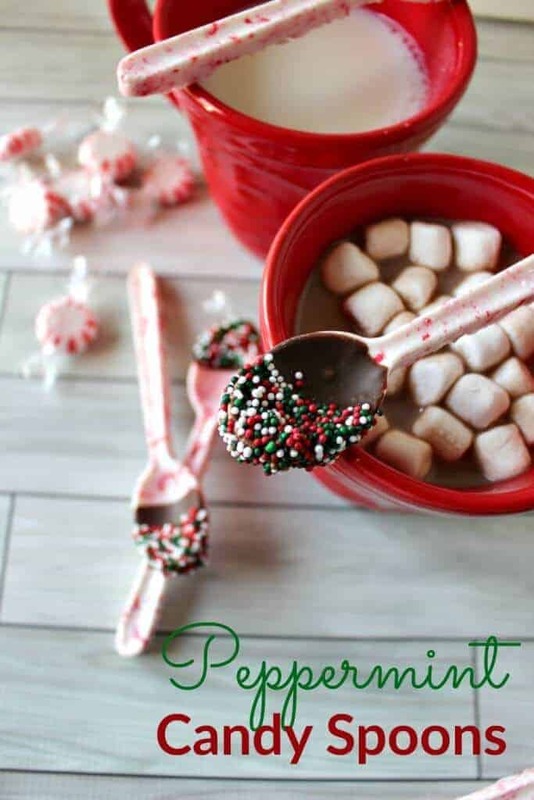 Looking for some other great Christmas treat ideas? 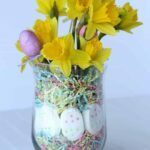 Check out some of these super easy and delicious options! Wow, these cookies look so cute and yummy, Jenn!!! Such an amazing Christmas treat!!! I’m going to make these with cherry cordial kisses so I don’ t think the lemon is going to work. What would you suggest I use in its place? Maybe just vanilla flavor? Would you suggest any other changes to the batter? Almond extract would go awesome with cherry. Your cookie is a thing of beauty, Tricia! Figs and dates are a favorite of mine and I could probably eat several without blinking ? Love the little sprinkles on top too! Seriously? Christmas Blossoms Sugar Cookies use TEN pounds of butter to 1 cup of sugar? that would be 10 tablespoons….tbs… I don’t see these as 1/2 ” balls figure a Hershey kiss is 1/2″ at the base….and only making 18….something is amiss. They spread out so the kiss fits on top but doesn’t have a chance to sit IN the cookie. I doubled the recipe thinking we’d want more than 18 but I ended up with 60 cookies! I’m not sure why it calls for only 18 Kisses- that was another oddity when I made these. I will say the sprinkles did not melt. I used the thicker shaped ones as shown in the picture. I made the blossom sugar cookie they came out flat and couldn’t put the kiss on them 🙁 they taste great but to much butter. These are tasty and super cute! The only disappointment is that they don’t keep their shape like a traditional pb blossom cookie. They spread out like other sugar cookies. The pics in the blog show that but I hadn’t noticed until after the fact.